This book explores the many provocative questions concerning the fundamentals of data analysis. It is based on the time-tested experience of one of the gurus of the subject matter. Why should one study data analysis? How should it be taught? What techniques work best, and for whom? How valid are the results? How much data should be tested? Which machine languages should be used, if used at all? Emphasis on apprenticeship (through hands-on case studies) and anecdotes (through real-life applications) are the tools that Peter J. Huber uses in this volume. Concern with specific statistical techniques is not of immediate value; rather, questions of strategy – when to use which technique – are employed. Central to the discussion is an understanding of the significance of massive (or robust) data sets, the implementation of languages, and the use of models. Each is sprinkled with an ample number of examples and case studies. Personal practices, various pitfalls, and existing controversies are presented when applicable. 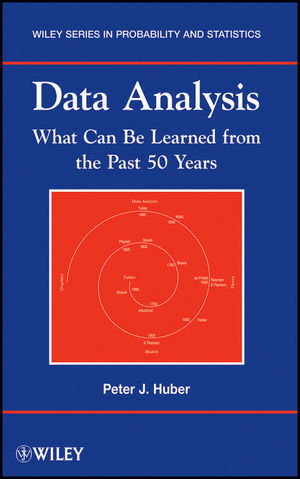 The book serves as an excellent philosophical and historical companion to any present-day text in data analysis, robust statistics, data mining, statistical learning, or computational statistics. Peter J. Huber, PhD, is a world-renowned statistician who has published four books and more than seventy journal articles in the areas of statistics and data analysis. He has held academic positions at Harvard University, Massachusetts Institute of Technology, Cornell University, and ETH Zurich (Switzerland), and has made significant research contributions in the areas of robust statistics, computational statistics, and strategies in data analysis. A Fellow of the Institute of Mathematical Statistics and the American Academy of Arts and Sciences, Dr. Huber is the coauthor of Robust Statistics, Second Edition, also published by Wiley. 1 What is Data Analysis? 1.2 The Path of Statistics. 2 Strategy Issues in Data Analysis. 2.1 Strategy in Data Analysis. 2.5 The stages of data analysis. 2.6 Tools required for strategy reasons. 3.3 What is i massive? A classification of size. 3.5 On the structure of large data sets. 3.6 Data base management and related issues. 3.7 The stages of a data analysis. 3.8 Examples and some thoughts on strategy. 3.10 Supercomputers and software challenges. 4 Languages for Data Analysis. 4.2 Natural languages and computing languages. 4.5 Requirements for a general purpose immediate language. 5.3 Mathematical statistics and approximate models. 5.4 Statistical significance and physical relevance. 5.5 Judicious use of a wrong model. 5.7 Modeling the length of day. 5.8 The role of simulation. 6.3 Regression of Y on X or of X on Y. 7 Create order in data. 7.5 Multidimensional scaling vs. Correspondence analysis. 8.3 Comparison of point configurations. 8.4 Notes on numerical optimization.